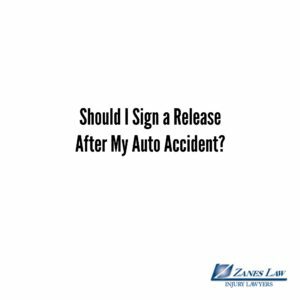 Home » Car Accidents » Should I Sign a Release After My Auto Accident? I have received medical and property damage releases from the insurance company adjuster and other parties. Should I sign them without a lawyer? Releases for medical records or property damage should only be signed under limited circumstances. In fact, adjusters are known for having accident victims sign releases as soon as possible so that no further legal action can be taken. For example: we have many people who call us stating they signed a release and received $500 or $1,000 for their auto accident, however, a few weeks later the pain from the accident has starting to settle in and they now need our help. At this point- it’s too late. You signed and accepted money which means no further action can be taken and no additional money can be paid out. That’s why our attorneys always advise people not to sign or accept any money unless they are 100%+ sure they are feeling better, do not want to hire an attorney, and do not plan on seeking any type of legal advice.